Your going on vacation so treat yourself to a very comfortable clean quite cottage near all attractions thats located in a safe clean neighborhood with a 24hr. grocery deli across the street thats very convenient. Large T.V. and wifi provided also coffee maker and coffee .You have a large private courtyard thats great for cocktail hour and all hours.New Orleans is a small but cosmopolitan city, and nowhere in town is this more apparent than in the Marigny Bywater area, you can find more bars, cafe's, restaurants and fun things to do than in many large cities. Whether you seek a wild or relaxed experience, to expand your horizons or stay in your comfort zone, you will find it all here. This comfortable, private cottage has space to relax and unwind in the heart of the Historic Faubourg Marigny Neighborhood, surrounded by Mardi Gras dens, many music venues, bars, and restaurants. A 2 min. walk brings you to a beautiful park on the Mississippi River. A 5 min.five min.walk from the cottage takes you to Frenchman street where you will find plenty amazing Jazz clubs, hip cafes and restaurants that should not be missed.Then 3 blocks down Frenchman St. you are in the French Quarter also know as the Vieux Carre (old square) Our cottage offers access to the adventure and mystery of New Orleans away from the crowds and noise of Bourbon St. but still close enough to walk. The cottage offers a queen size bed and a queen size sofa bed, so it can sleep up to four guests comfortably, though it's ideal for a couple. A full size refrigerator, microwave, bottled water and coffee are all provided. Want to enjoy cafe au lait at a sidewalk cafe? Stroll down to Cake, Flora's or Orange couch, all within three blocks. Would you prefer seafood brunch with friends over bloody Mary's and mimosas? Ride the bikes down to Elizabeths, eight blocks along the river. Or grab a snowball at the stand on Piety street stand and walk through the new riverfront park to watch the ships go by. Experience the night life and live music of Frenchman street or the French Quarter, minutes away on foot or bike, or hit one of the top rated fine dining restaurants in the neighborhood such as The Franklin, Mariza, or Feelings Cafe. Prefer to stay at home? The top-rated pizza restaurant in town is 6 blocks away and they deliver. So does the Ukranian restaurant at Siberia, the Turkish Kebab place on St. Claude and a dozen others - you can even have a bloody Mary delivered to your doorstep. Craving BBQ? Best in the city at the Joint is just a few blocks away. Whatever you are looking for in New Orleans, you can find it from your own little oasis in the heart of downtown. I'm Brendan, born and raised in New Orleans.I have been providing historical tours from the seat of my mule-drawn carriage for over 24 years.We use mules instead of horses in New Orleans because of our climate.They are much stronger, sure footed and smarter also.I think I have the best job in the world. My love, Valerie, works as nurse at a local hospital. She moved to New Orleans from Mississippi a few years ago. 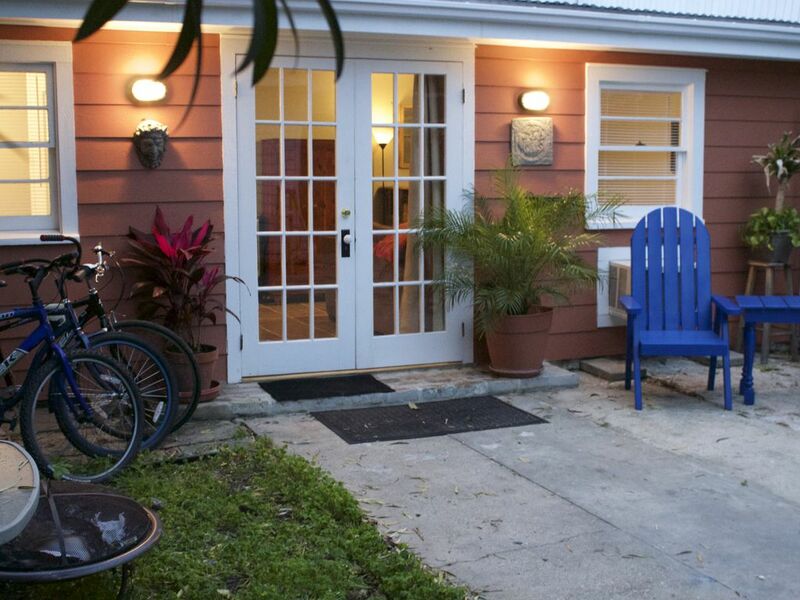 We truly enjoy sharing our home, rental cottage, neighborhood, and city with travelers. I can point you in the right direction to just about anything this city has to offer. Eating drinking and laughing is a large part of our culture down here and we live it. This property is located in the historic Faubourg Marigny neighborhood. It is the coolest and most fun neighborhood in New Orleans. This neighborhood was developed by Bernard deMarigny in 1805 on his familys plantation. Many styles of New Orleans architecture can be found here. You can spend hours wandering and your never far from local watering holes full of colorful characters. If you want music you have a variety to choose from just a few blocks away on Frenchman St. and a couple blocks past Frenchman puts you in the French Quarter.All within a 10min walk.If you choose to hangout in the Faubourg Marigny we also have great nightlife and many great restaurants with real New Orleans flavor and culture. Read the reviews that I am very proud of everyone seems to love the cottage and neighborhood. You are staying in a New Orleans neighborhood with true character. You will get the true feel of our city. One bathroom with stand up shower. If you are staying for more than a few days you are welcome to use our washer n dryer. Guest is welcome to use our washer and dryer. Just ask. Always street parking available. If not guest can park in front of driveway. We provide complimentary coffee, sugar, and creamer, as well as bottle water during your stay. We provide disposable plates and utensils. Bar available for dining inside. Beautiful Courtyard has tables for dining or enjoying your morning coffee. Roam around town just as we do. Two complimentary bicycles and helmets provided. Large private courtyard. Great place for morning coffee and cocktail hour. Great location near French Quarters and Bourbon Street. A very Nice walk.We took Royal street to the canal. There is a market in front that is open 24 h.
Brendan the owner was hospitable and helpful. The place is clean,confortable and safe. This was a beautiful place very close to my favorite part of New Orleans. There was also a delicious bakery and cafe nearby. The place itself was very nice, it had a couch with TV, a fridge and even a desk for working. Brendan was an incredibly attentive host who did his best to make sure I had a great time. Thank you for a great stay and can't wait to come back! The perfect cottage! Cool neighborhood, close to everything, super clean, and nice outside space. Owners were lovely! Brendan greeted us with open arms and guided us towards the great local spots. The cottage was clean, inviting, and quiet. The area had local cafe, bars, food, and amazing all night market for snacks across the street. It was amazing waking up to smell of roasting coffee from down the street each morning. 10 min walk to French quarter, few more minutes to Bourbon street, and not much farther to access downtown. New Years events were close enough to walk to and location was far enough away to be quiet if needed. Enjoyed food and entertainment provided by Brendan and friends and had a memorable time. We will be back! Very cute little cottage close enough to the action to be fun, far enough away to get away and be quite. The owner is very nice and helpful. Will be back and recommended it to my daughter, also. We want our guests to live like a local during their stay here in New Orleans and feel the warmth of the city. We want you to remember this trip forever. This neighborhood the Faubourg Marigny, which borders the French Quarter, was developed by Bernard de Marigny in 1805 on his family's plantation. Marigny famously named the streets of his neighborhood Peace, History, Poets, Frenchmen, Greatmen, Goodchildren, Music, Love,and Craps to name a few. Many have been renamed today. He squandered the family fortune playing Craps(he brought the game to New Orleans) and with ladies of the night in Storyville, the red light district of New Orleans, till 1917. Storyville was located in the Faubourg Treme and is the birth place of Jazz. You can visit his tomb in the St.Louis Cemetery #1. Wander around to see many different types of architecture we are famous for. Shotguns, Creole Cottages,Townhouses. Many with gingerbread woodwork and beautiful iron work. Two blocks from the cottage is Crescent park located along the mighty Mississippi River. A wonderful spot to enjoy a few drinks and watch port traffic from huge freighters and cruise boats from all over the world. We provide our guests with bicycles so they can explore the city just as we do. New Orleans is phenomenal place for music lovers because live music can be found every single night of the week in dozens of nearby venues. The best are within walking distance from our property. Frenchmen Street is just a few blocks away, where you can find traditional dixieland jazz, blues, reggae, soul, and more at places like The Spotted Cat, The Blue Nile, DBA, and Three muses. Please notify owner if expecting guests. No unexpected or unregistered guests. Please keep the courtyard gate locked.